Multiplying and dividing in Excel is easy, but you need to create a simple formula to do it. Just remember that all formulas in Excel begin with an equal sign (=), and you can use the formula bar to create them. Let's say you want to figure out how much bottled water that you need for a customer conference (total attendees × 4 days × 3 bottles per day) or the reimbursement travel cost for a business trip (total miles × 0.46). There are several ways to multiply numbers. To do this task, use the * (asterisk) arithmetic operator. For example, if you type =5*10 in a cell, the cell displays the result, 50. Suppose you want to multiply each cell in a column of seven numbers by a number that is contained in another cell. In this example, the number you want to multiply by is 3, contained in cell C2. 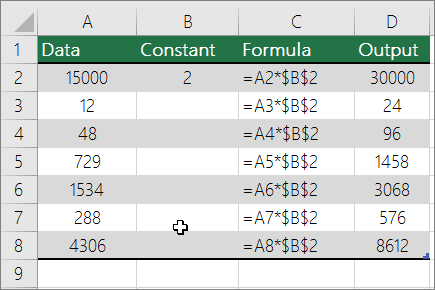 Note: Using $ symbols tells Excel that the reference to B2 is "absolute," which means that when you copy the formula to another cell, the reference will always be to cell B2. If you didn't use $ symbols in the formula and you dragged the formula down to cell B3, Excel would change the formula to =A3*C3, which wouldn't work, because there is no value in B3. Note: In Excel 2016 for Windows, the cells are populated automatically. To do this task, use the / (forward slash) arithmetic operator. For example, if you type =10/5 in a cell, the cell displays 2. Important: Be sure to type an equal sign (=) in the cell before you type the numbers and the / operator; otherwise, Excel will interpret what you type as a date. For example, if you type 7/30, Excel may display 30-Jul in the cell. Or, if you type 12/36, Excel will first convert that value to 12/1/1936 and display 1-Dec in the cell. Note: There is no DIVIDE function in Excel. 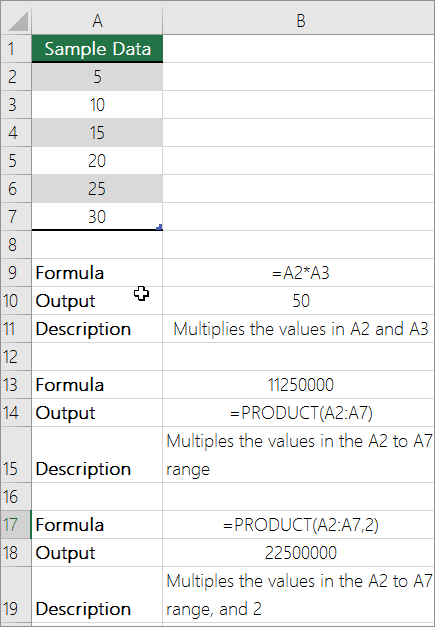 Instead of typing numbers directly in a formula, you can use cell references, such as A2 and A3, to refer to the numbers that you want to divide and divide by. The example may be easier to understand if you copy it to a blank worksheet. Create a blank workbook or worksheet. Select the example in the Help topic. Note: Do not select the row or column headers. In the worksheet, select cell A1, and press CTRL+V. Suppose you want to divide each cell in a column of seven numbers by a number that is contained in another cell. In this example, the number you want to divide by is 3, contained in cell C2. Drag the formula in B2 down to the other cells in column B. Note: Using $ symbols tells Excel that the reference to C2 is "absolute," which means that when you copy the formula to another cell, the reference will always be to cell C2. If you didn't use $ symbols in the formula and you dragged the formula down to cell B3, Excel would change the formula to =A3/C3, which wouldn't work, because there is no value in C3.